Yay, 7 more working days to go... I skipped 2 posts cause really busy this week. Busy training up my replacement, we are making appointments to cover whatever we can after office hour and also tomorrow (Sat) to ensure smooth transition... Next week will be going off for a long break due to Raya holidays and company shut down. We will be travelling back to hometowns and catching up with love ones. 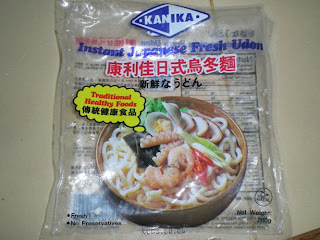 I miss the food in my hometown and also high time to spend some time with my dad, the last trip back was 2 months ago. We will be going to Bidor to visit my sis's family and get to taste the delicious rendang, ketupat and raya cookies.... so blogging will have to take a break...... happy holidays! Also to match with the outfit I asked them to sing a Malay folk song in which they gladly did (with some dance moves too)... enjoy.. to all Muslim readers, "Selamat Hari Raya"...and for those who will be having a long break, "Happy holidays and drive safely". I went to Giant to get some water containers and pencil leads for Michelle, as I walked along the stationery aisle, I picked up a box of water color and a drawing block, it has been a while since I did art work with the girls and I’m running out of games to play with them. 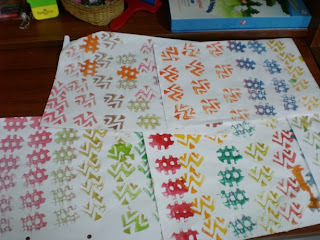 Thanks to mamajo who suggested that I did some pattern stamping using water colors. I remembered doing this decades ago as part of my school art project and can’t believe that after 20 more years I’m here doing it again with my girls this time. I took a potato, cut into half and start carving the pattern that comes to my mind. The girls are so amazed with me, they even praised me for being so wise (ha ha ha, you see it’s not that hard to amuse and amaze your children, all it takes is to dig your skill and expertise that you acquire decades ago!!). 10 days to go, feeling remain the same, work as normal. My big boss called up yesterday, we are suppose to meet up but due to urgent matter that he need to settle back home, he called to say a few words and make sure my last day issue has been settled. Later we exchanged some smses and ended with well wishes. He is a nice boss, I worked for him for the past 12+ years, a very outgoing, open and supportive boss. He is like a father figure to me. I have had the opportunity to work for him directly for a few projects and I would say he is the one who gave me the opportunity to travel to all the different sites for exposure and audit purposes, all this traveling has enriched my experience and opened up my mind. Larry, I want to thank you and I want you to know (if you are happening to read this post) that you are a wonderful boss, thank you for your support and guidance and we will keep in touch. This post is to fulfill Ling's wish and I want to thank her for giving me the opportunity to recollect below wonderful memories with my hubby. 1. In which month and year did you met your husband for the first time? In uni days, year 1993, he was a freshie then..
2. In which month and year did you two officially starting dating? 3. Where was the first dating place the two of you went to? 4. What was the most touching thing he did to you when you two were still dating? 5. How about after your marriage? 6. Share your lowest period of your life with him. 7. Share your happiest moment with him. 8. Share your saddest moment with him. 9. Share your angriest moment with him. 10. Share your funniest moment with him. 11. Share your most frustrated moment with him. 12. Lastly, when was the last time you two hold hands and walk under the moonlight, like how you used to do? 11 working days to go! Hubby suggested that I write countdown posts for my stay in my present company. Yeap, 11 more working days to go. Finally have sorted out with my boss that somehow she is releasing me on the 10th Oct with condition that I spent sufficiently amount of time with my new replacement. Since my replacement can only officially join 2 weeks after I leave, we need to make arrangement for the handover during weekdays (after office hour) and on Saturdays. I’m sorting things out to ensure the transition is as smooth as can be, imagine the things that I accumulated over the past 12+ years. I’m glad I had the opportunity to train my Engineer to take over almost 80% of my current responsibility, I can confidently announced that he is capable of carrying my responsibilities, just that he need more time to work on his management/people skills and to exercise his EQ. That’s why the management thinks that he is just not ready yet to take up my current position. It is part of my succession plan for him to go up though…. b) My engineer and supervisors? 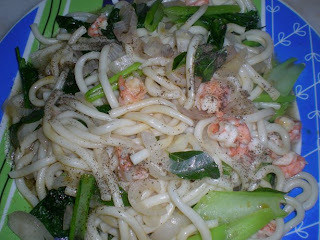 Put 2-3 tablespoon of oil into work, stir fry onions until fragrant, put in prawns/meat, stir fry until meat is half cooked, put in vegetable and ½ teaspoon of salt, stir fry for another 1-2 minutes, put in Udon and ¼ cup of water. Separate the Udon using the ladle, the water should help to separate them, put in curry leaves and black pepper, cover the wok for 1-2 minutes. Pour in sauce and stir fry till sauce thickens. Serve hot... I sprinkle additional black pepper before serving. I've been trying to exercise more regularly recently and found one really nice spot near to my working place, around 10 minutes drive and about 20 minutes away from home. Since I discovered this place, I've been there 4 times (if I counted correctly) and each time I brisk walk for 5-6 rounds (around 3km), 30 - 45 minutes each session. Sometimes hubby accompany me, he will jog while I walk, twice the kids tagged along. The place was visited by quite a lot of people in the evening and I believe in mornings too, it is maintained by MPPP - Penang local council with ample of greens, flat walking/jogging path, exercise tools, a badminton and basketball court. It is situated in Taman Sri Nibong, behind the Crystal Point complex. I can see a lot of regulars there, at least for the first 4 trips I was there. I observed people in different colors of skin coming together and chatting with one another like good old neigbbors, what a wonderful sight. I’m sure you have asked your child before what they want to become when they grew up? Michelle wanted to become a teacher and Emily wanted to become a nurse, over time Emily changed her mind and her latest ambition is to become an art teacher. Michelle: Mummy, is it good to become a chef? Me: Well, if you love to cook for people, why not? Me: Sales girl ar… depends but it’s quite boring wor..
Michelle: Guess what Jordon (her classmate) like to become? Me: Later… mummy would like to become one also. Michelle: Who will you be teaching? I wonder how many of you out there sticking to your original ambition? Yesterday after their evening bicycle ride, Michelle came sticking onto me while Emily was busy entertaining neighbor's daughter. Michelle: Mommy you know who is the person I love most? We may be experiencing some political instability this coming Tuesday, 16th September. Friends and colleagues reminded me to stock up goods for my family. So I really did… stock up rice, milk powder, instant noodles, dry bee hoon, biscuits, cakes, drinks, fruits, eggs….. called me “kiasi” or what but even if I can stand hunger, my precious daughters can’t. This afternoon we were jokingly discussing that maybe in our generations to come we may have to move out of our current land and forced to reside somewhere else. I have never thought of that, well as much as we seek for equality and justice, somehow we are conditioned to accept the fact that in this evil and decaying world we are in, equality and justice that we desired may not be attainable… unless majority has the guts to stand up against all odds in spite of the potential hardship that one may faced in the course of doing so. A country is like a company, we have the board of directors and executives to run the company, the top guys set the rules, policies and decide how things should be run and done. Employees desired for equality and justice in pay, benefits, way of treatment and opportunity in the career ladder. Most of us work with others and some are bosses of their own….. for those who work with others I’m sure we seek equality and justice in the company that we work with and I hope for those who run their own business they will exercise equality and justice. Now if you yourself experienced injustice or you know somebody who are treated in an unjustly manner, what will you do? For those who are like me being “kiasi”, please do stock up ya… just in case. Let’s pray for peace and goodwill on earth. 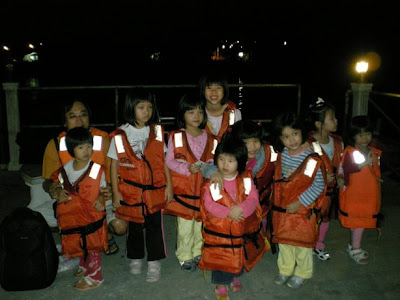 Anyhow we went for a short night getaway (with lil Emily with us, the jeh jeh got drawing class that night). 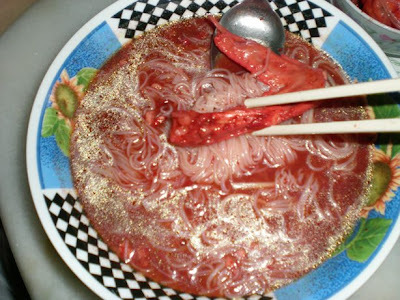 MIL cooked "hong chau mian sien - red wine noodle",a must for "Fu Chow" family on auspicious celebrations for dinner. It was indeed yummylicious..
Last Saturday, 5 families from my church gathered for a little trip to the mainland. 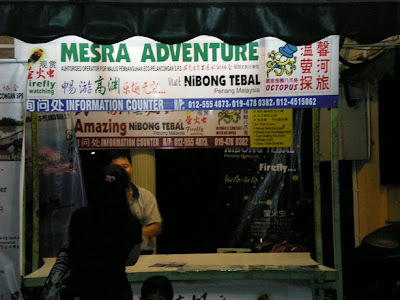 There are about 20 of us and we droved in 3 cars to the mainland and straight to a small town called Nibong Tebal. Our purpose is to see fireflies…. The adults were as excited as the children… We had a little jam once reached the bottleneck of Penang bridge but after that smooth sailing until we reach our destination. The journey took us around an hour. 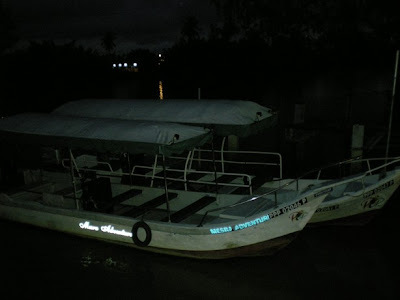 We took dinner at one of the restaurants, walked a short distance to the nearby jetty. The person in-charge welcomed us and in less than 10 minutes, our boats had arrived. The children... if you realized all girls, 9 of them!! !